In this paper we present a fast approach to range image segmentation. 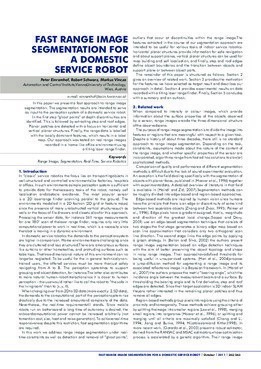 The segmentation results are intended to serve as input to the perception system of a domestic service robot. In the first step “ghost points” at depth discontinuities are identified. This is followed by extracting step and roof edges. Planar patches are detected with a focus on horizontal and vertical planar structures. Finally, the range data is labelled with the locally dominant features, which results in a label map. Our approach was tested on real range images recorded in a home-like office environment using a tilting laser range finder.